R.W.Bro.Jack Piket was born on 12th February, 1902 in The Netherlands and came to Australia as a small child with his parents. He passed away at 6.45am on Saturday 3rd August, 2002 at the age of 100 years at the Star Nursing Home in Beaudesert, Queensland. He attended Norman Park State School and began work in the meat works as a young lad and worked as a slaughterman until his retirement in August, 1966. R.W.Bro.Piket was initiated in 1928 into Edmund McDonald Lodge No.51 in the old Alice St. Temple. He joined Dennistoun Lodge No. 301 in about 1934 where he was Secretary for 33 years from 1950. As well as being Foundation Master of Camp Hill, he was Director of Ceremonies (DC) for 24 years from 1947 until 1970. His influence in no small part accounts for Camp Hill’s traditional emphasis on ritual work. R.W.Bro.Piket was noted in Camp Hill Lodge even into his late nineties, for his incisive and inimitable delivery of ritual and charges. R.W.Bro.Piket was still an active member of the Lodge until the last few years of his life when he found the steps in front of the Stones Corner Masonic Centre too difficult to negotiate. V.W.Bro.John Edgar A.G.S.Wks presents R.W.Bro.Jack Piket P.A.G.M with his jewel (medal) for 70 years of meritorious service to Queensland Freemasonry. 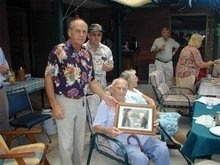 Ross Tipler, PM of Camp Hill Lodge, presents a framed photo to Jack on his 100th birthday.